Arcus will allow astronomers to archieve top Decadal science goals and enable a broad range of community science, thus ushering in a new era of X-ray spectroscopy. Our main goals, however, are to answer the following questions. (1) How does matter cycle in and out of galaxies and clusters of galaxies? Bright background sources act like flashlights, illuminating material at and beyond the edges of galaxies and galaxy clusters. By observing several lines of sight through these structures, Arcus will allow us to map the locations, motions, and temperatures of the hot gases there (see Figure 1), including the famous "missing matter" in the outskirts of galaxies and galaxy clusters. This will lead to a deeper understanding of the formation and cycling of metals in and out of these structures, and provide clues about the origin and fate of the hot gases. Figure 1. Top Left: An example of a line of sight to a distant AGN (red star) that passes through three hot gas clouds: A (assumed to be part of an inner galaxy halo), B (part of a galaxy group halo), and C (part of an outer halo). Top Right: A simulated Arcus spectrum showing absorption from ionized oxygen in each of those clouds. 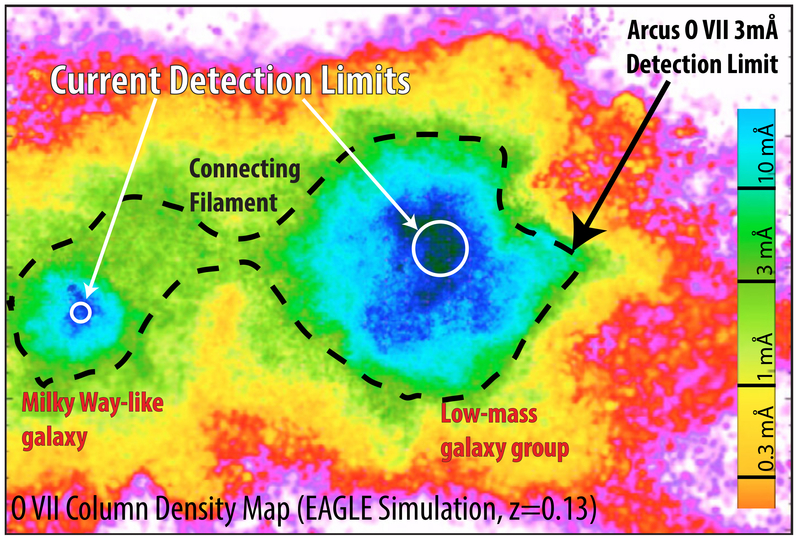 Bottom: A simulation of ionized oxygen surrounding a low-mass galaxy group and a Milky Way-like galaxy. Arcus will measure gas properties in the filaments connecting the two widely separated (~1.5 Mpc) systems. (2) What powers supermassive black hole winds that can affect entire galaxies and clusters? X-ray spectra are necessary to investigate how physics behaves at the extremes of space and time near a black hole and learning how supermassive black holes have formed and evolved. In order to be able to make these observations in a reasonable amount of time -- a few kiloseconds -- a large effective area is required. High spectral resolution over a broad bandpass is also needed, in order to measure spectral changes that reveal the ionization state, density, and total mass flux in outflowing material near the black hole. Arcus detects nearly every iron ion, allowing far more sensitive studies of absorption than other observatories, as can be seen in Figure 2. Figure 2. Left: A depiction of a black hole and its surroundings. Right: A simulated Arcus spectrum showing absorption from black hole winds. 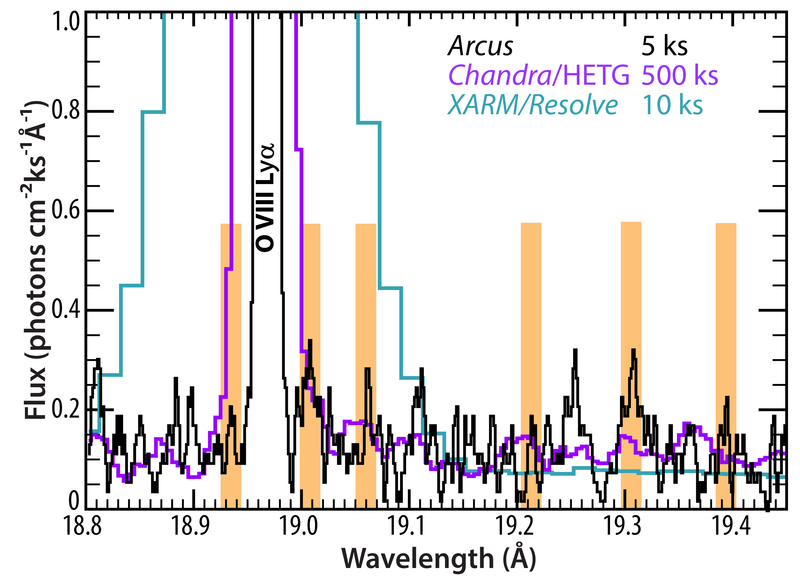 ESA's Athena mission, slated to launch in 2028, will not have sufficient spectral resolution at these wavelengths to make such detections. (3) How do stars and protoplanetary disks form and evolve? The final stage of star formation is driven by the accretion of a protoplanetary disk onto the nascent star (see Figure 3). During this phase, planets are also formed. But a long-standing mystery surrounds young stars: they are rotating far too slowly, given that they are still adding mass and contracting. Do young stars lose angular momentum from an accretion-driven wind? And how do the streams of accreting material interact with the stellar magnetic fields, producing levels of magnetic activity far higher than that seen in their main sequence counterparts? Only high-resoltuion X-ray spectra can shed light on these processes. Figure 3. 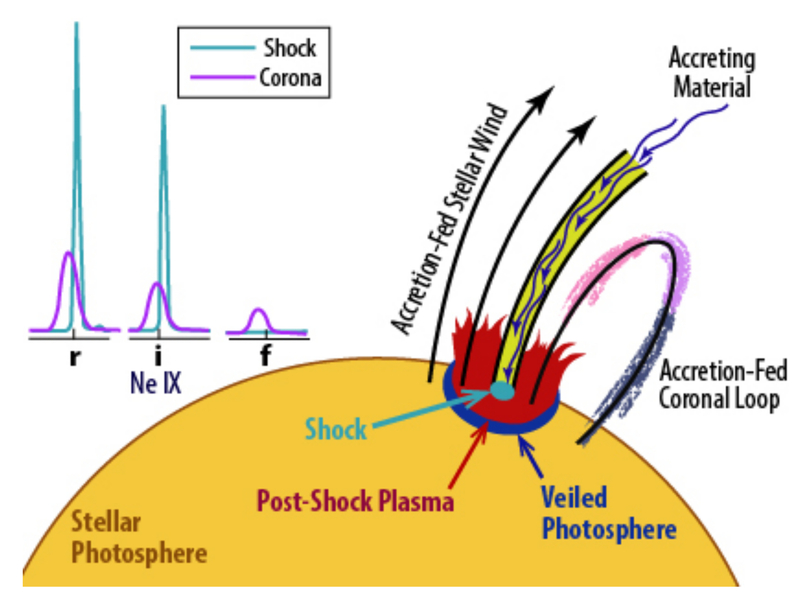 Left: A sketch of accretion onto and stellar wind from a young star, with a depiction of how ionized neon emission from the corona and shocks near the surface will be easily differentiated in Arcus spectra. Right: A simulated Arcus spectrum showing emission lines from a young star. Observations of the lines highlighted in yellow, which neither Chandra nor XARM missions can detect, are needed to test coronal heating models.